Arakhs are used by the Dothraki. Blade is full tang and made from high carbon steel with black oxide finish. Blade comes with silkscreened wood display plaque with the Dothraki symbol and certificate of authenticity! Take home a piece of the HBO hit series Game of Thrones!The Game If Thrones Khal Drogo's Arakh Sword Prop Replica features the khal's unique blade measuring about 14-inch long. The blade is full tang and is constructed with high carbon steel with a black oxide finish. The hilt is made of painted and carved wood detail. Display the khal's blade with the included silkscreened wood display plaque with the Dothraki symbol. 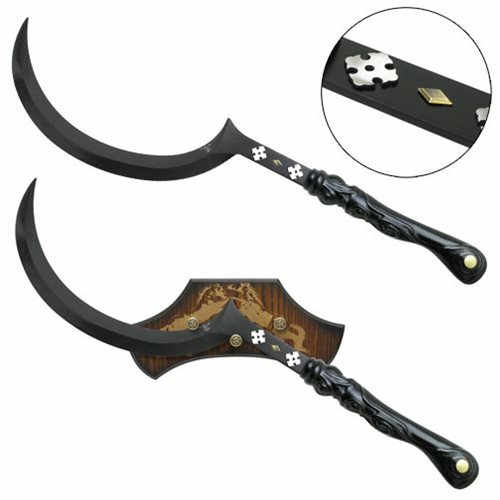 The Game If Thrones Khal Drogo's Arakh Sword Prop Replica measures 39 1/2-inches long and comes with a certificate of authenticity. Ages 18 and up.